The sculpture is cropped to emphasize the bicep, a visual articulation of physical and conceptual male power, while the intensified color shifts the mood from cool classicism to arrogant presumption. 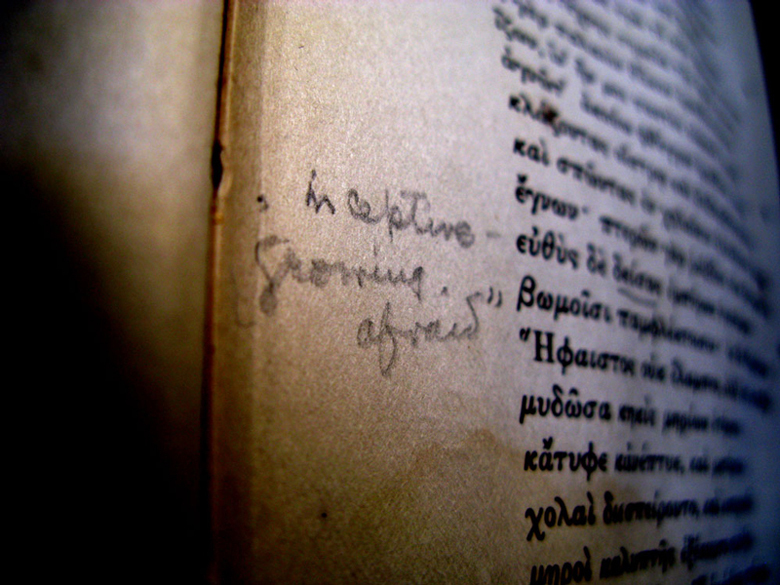 The marginalia notes that τυχεîν (happens, occurs) is nuanced, a word used when the author wants to suggest specifically not only that an occurrence is happening, but that as a result, one is getting what one wants. In the background, the swell of the muscle suggests, less subtly, how exactly that might happen. A woman raises her hand, in close-up, fragmented view. 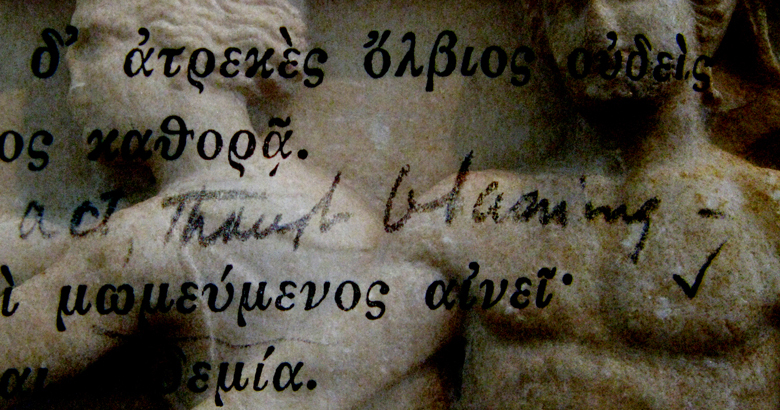 Handwritten words note the 2nd singular,addressed to the figure: “you speak, you tell me.” Brackets placed around the mouth of the mute sculpture beg it to speak, suggesting her words might have an oracular power. 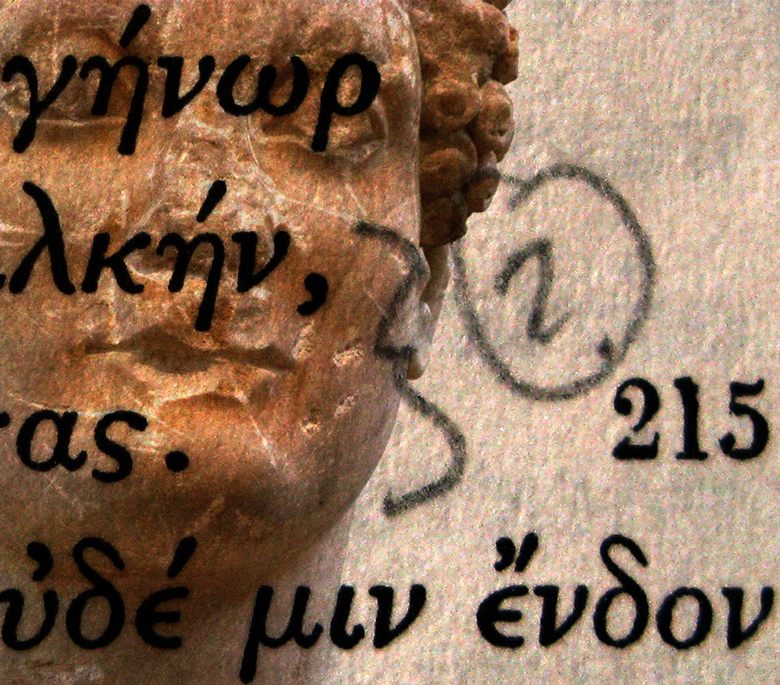 Against an intense red background, the Greek and English letters are a dense and velvety black. 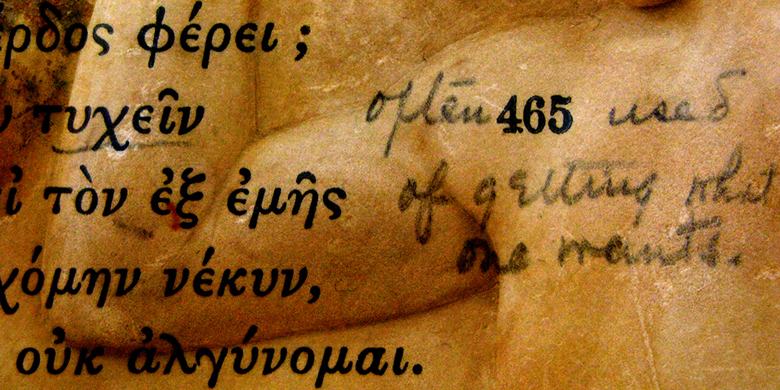 The page of Greek text is thickly textured, uniting the background and the sculpture with a single surface texture, visually fusing the centuries together. A sculpted hand reaches out actively, simultaneously remaining still. 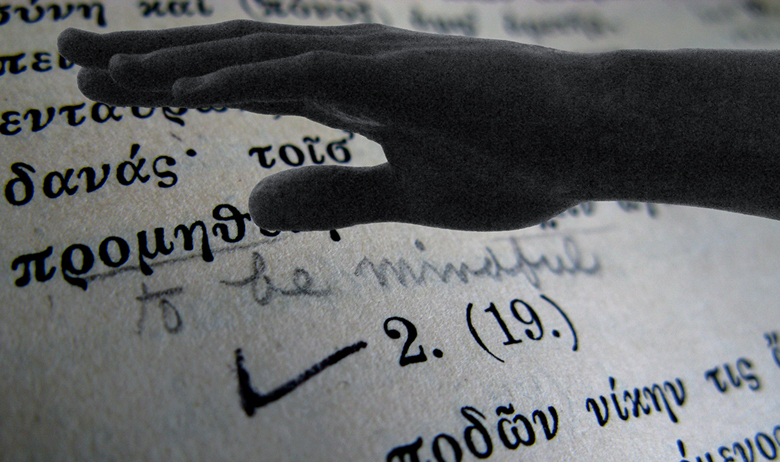 The horizontally cropped frame emphasizes the stretching arc of the fingers, which echo and embrace the curls and contours of the ancient text. A confirming check mark grounds it all. Dyed into translucent fabric, this image becomes a visual analogue for the ephemeral past permeating the concrete present. The contemporary experience of viewing the artwork becomes infused with ancient knowledge; conversely, one cannot view the past in this artwork without also seeing through it to the present world. Physicality and body language – a confident gesture, a swelling muscle – can be read as power signals, as proof that a leader assumes his word will be “beyond all question.” The expectation that power is an inherent right drawn from the assertion of physical strength says something about certain universalities of human experience. 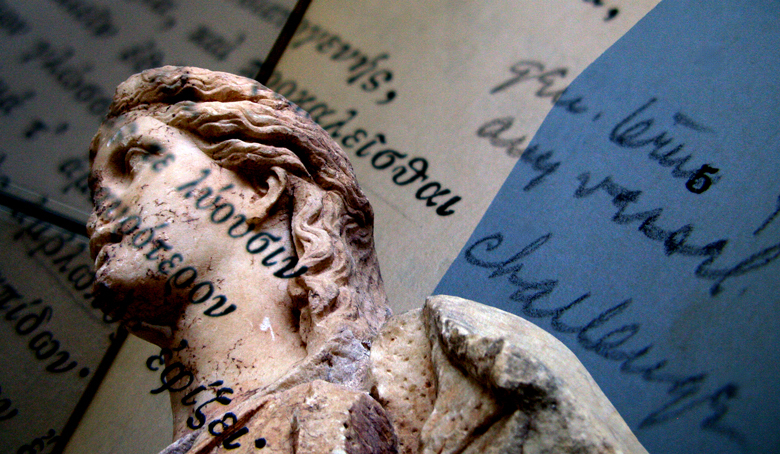 Images and texts can speak to us across the centuries, about lessons unlearned. How could one have to ask where the depths come in to Antigone? Meta Glass stopped and wondered, as she read a note of something that skimmed over the surface. 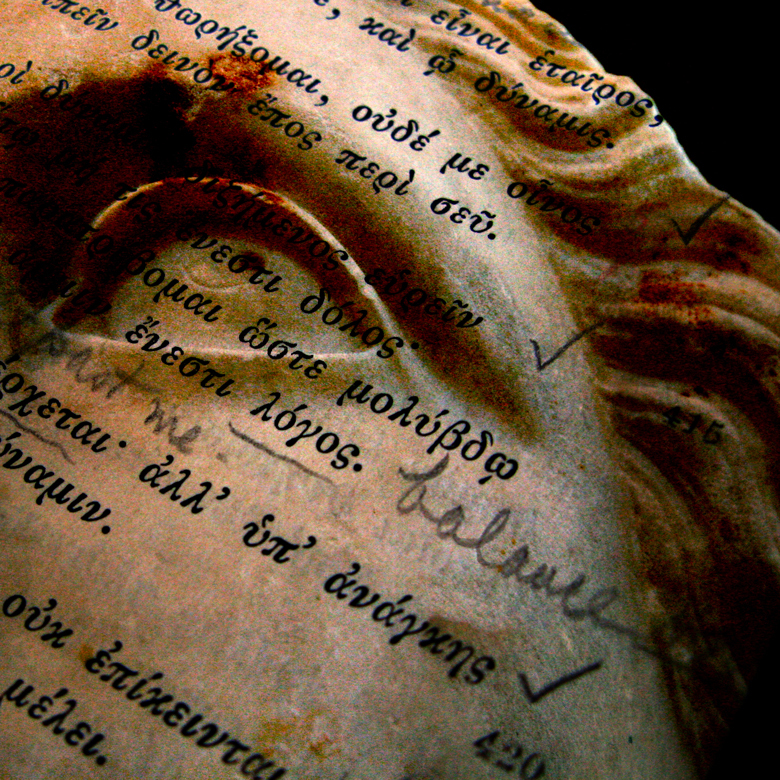 Do we look for depth anymore when we read? When we look at a sculpture, as it looks blindly into a changed world, do we stop, and take time to ask, to wonder what depths it holds in its being? Or do we just skim its surface, now broken and cracked, and walk past? The low angle forces us to look up at the sculpture literally and figuratively, to imagine her as stronger, more powerful than we are. The composition sets her off to the edge of the frame, facing her future, looking forward to the testing, the “challenge” she might be seeing ahead, as well as the one that also looms over her shoulder. Is she just “any vessel”? Or does she have the fortitude, the tenacity within her to meet the challenge, as this sculpture has met the centuries? Possess – actually written as an abbreviation for the possessive case used “here” – is a word of multiple meanings. Some signal ownership, power over another. The gentle grasp of the cloth could be a backing away, a protective gesture. To possess for oneself, however – perhaps that could be seen in this expressively stilled motion – to feel sure, confident within one’s self – or, in Antigone’s case, determined, possessed with the will to do what she felt was right. The extreme angle on the relief sculpture focuses attention on a line of elements through the center of the image – the ambiguous gesture of the hand to the shoulder, the downturned set of the mouth, the uncertainty of the glance back. The text, angled back in space and falling off into blur of cool blue, is anchored with an emphatically underlined word, right above that glance. Over the intensified warmth of the sculptural image, a connective arrow points out a phrase that generates more suspicion than trust, a phrase hovering between a manipulative request and a subtle demand. A woman rushes off, frozen in stone as she moves away from a man, who reaches towards her, or past her, but looks down. Compositionally, the word in front of her urges the woman to “act,” while the man seems checked off for blame. “Though” sits on her shoulder – a word that makes us stop to consider – who is to act, who is to blame, who is being blamed? These questions are as contemporary as they are ancient, the interpretive possibilities still just as manifold. Is Antigone’s pain ours as well? When you read the words, you have to take them on yourself – “my pain.” Are we reliving the tragedies of the past? Do we think it can “stop” at some point? The pitted and scarred face is that of a sufferer, accepting the past agony in calm silence, owning the pain, while marking its end. Hopefully we can be stronger for the ordeal. Is “balance” possible? Here, the word slides down at an extreme angle, visually forced into instability. The sculpture behind it stares off in the opposite direction, her past marked by the intensified stains of red that tinge her brow, her eyelid, her hair. If we tend towards the hopeful, we might focus on the power of her gaze, as she asserts herself to redress the imbalance. Translators are not always confident and self-assured, but sometimes question their own understanding, and perhaps the classics themselves. 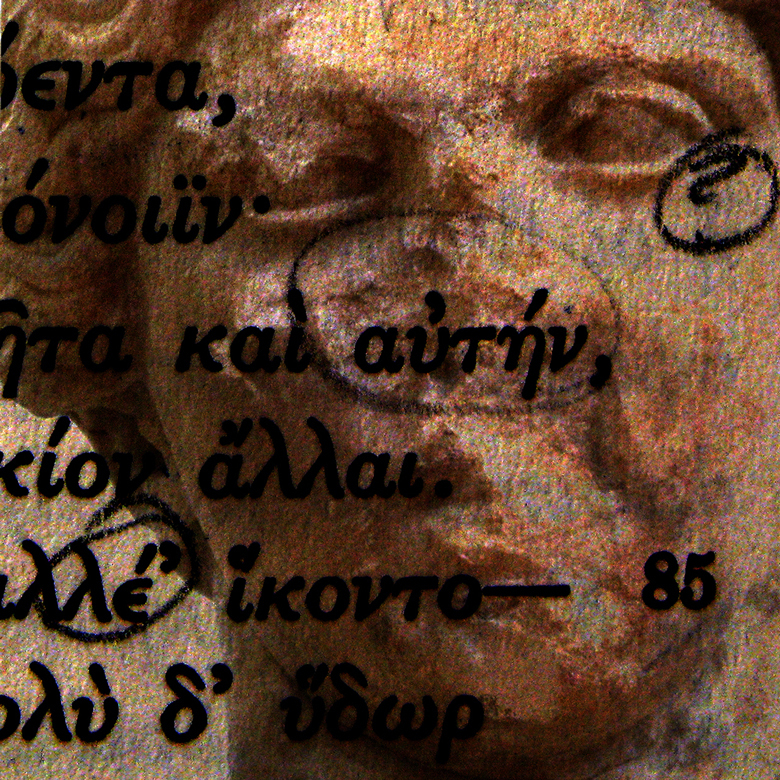 The ruined surface of a sculpture, further obscured with digital grain and unreal color, faces us nevertheless with a direct though pensive gaze, asking us if we have found the answers. 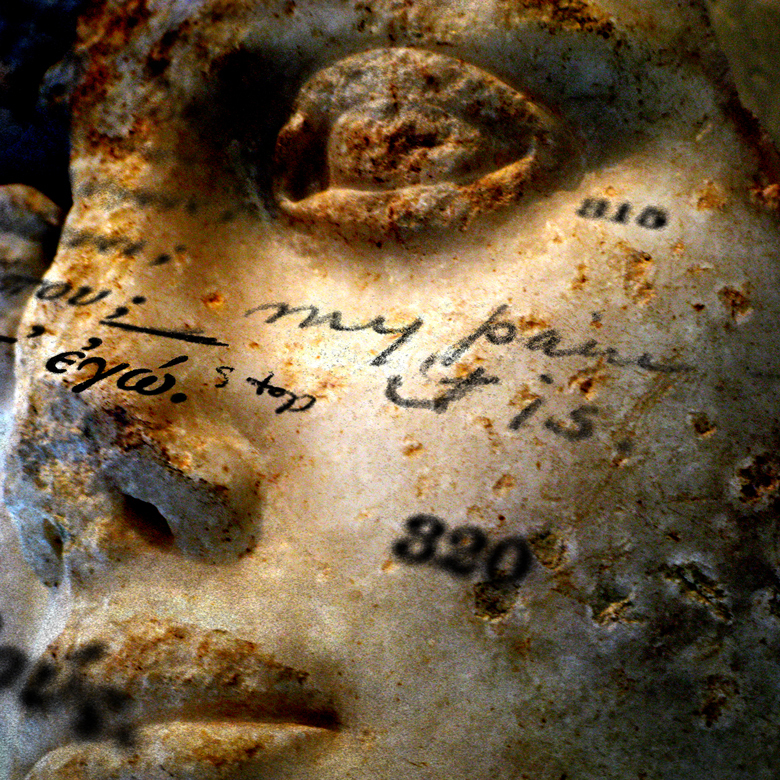 A scratched and battered sculpture, dug up after centuries buried in the ground, reflects the imperfections of human knowledge and experience, as do the circled question mark and the brackets that encompass both the text and the mouth. The sculpture manifests a contemplative beauty, despite the previously inflicted wounds. 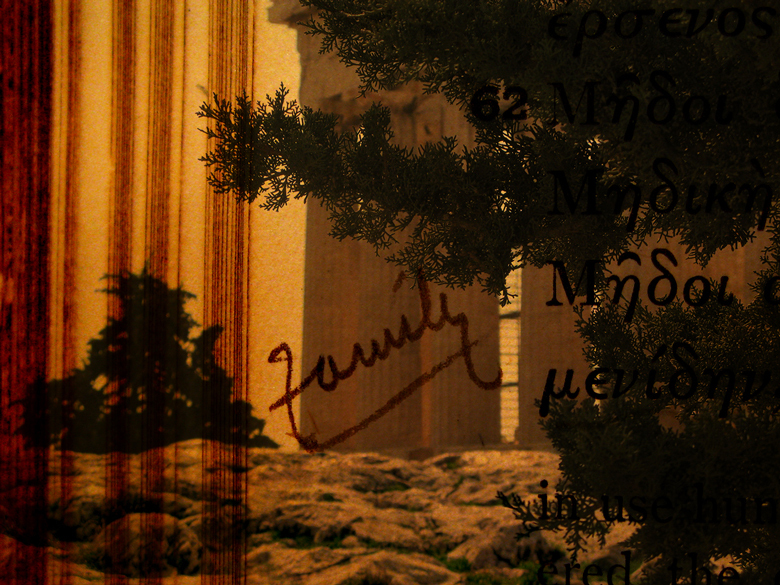 Similarly, the Greek letters elegantly cloak the intense struggles in the much older Mycenaean history that they tell. 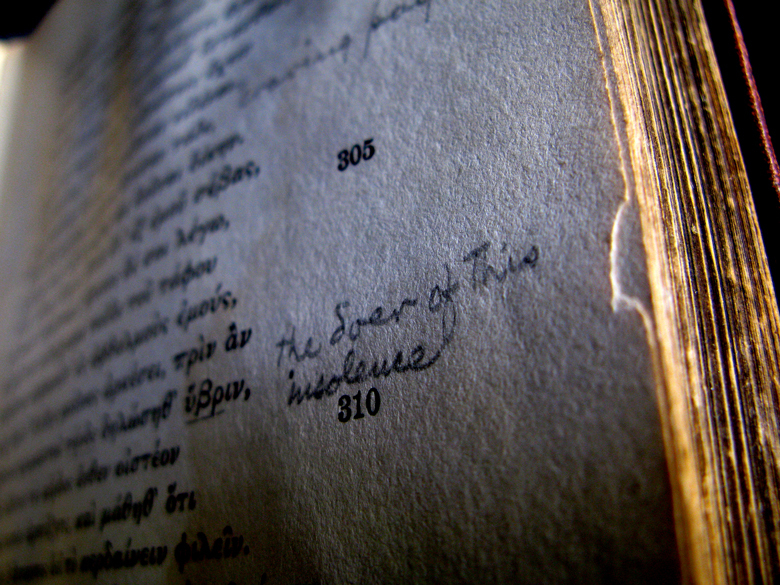 The marginalia of the Pages series carry their impact in words that echo and reverberate across centuries. 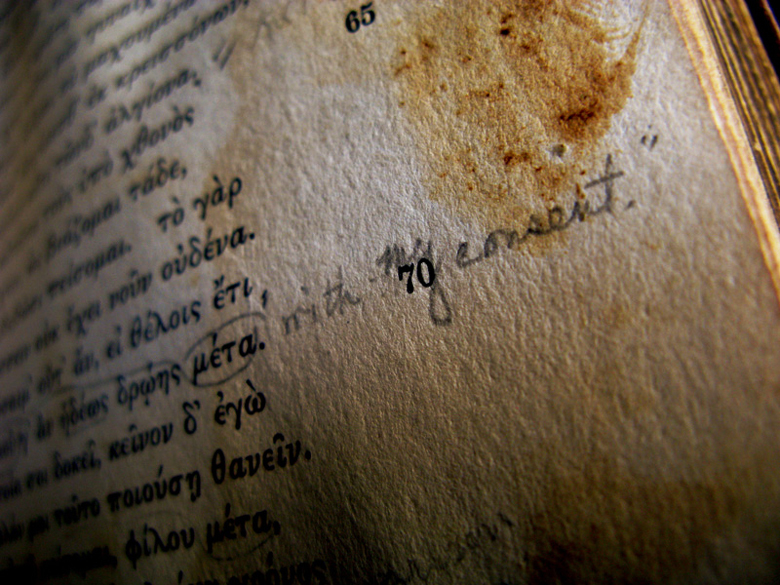 Perhaps this marginalia speaks of Antigone’s “insolence,” as she stands up against a male ruler. Or of Meta Glass’s “insolence,” for inserting herself into the male domain of classical translation and Ph.D. studies in the early years of the 1900s. And perhaps in 2016, it still had reverberations, as a woman dared to imagine that she could be the American president, the realm of men for well over 200 years. Emotional explosions are nothing new in human interactions. 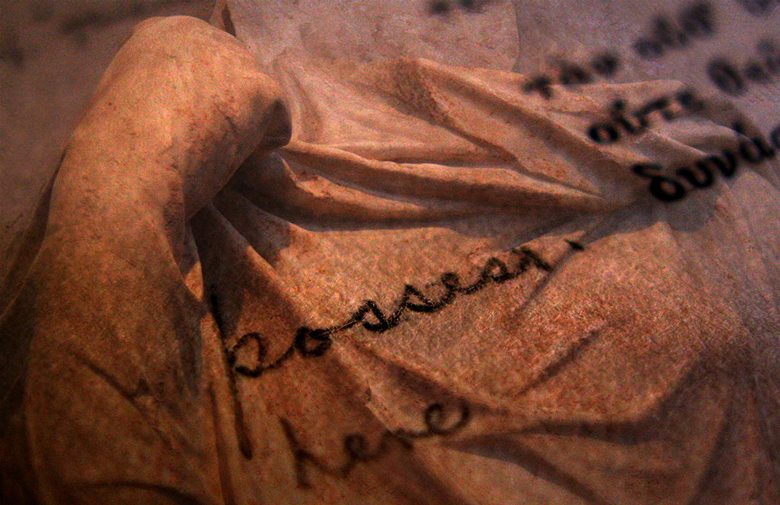 The warping of the page, the string breaking loose at the binding, the sharp bends of the page at the gutter, the reddened threads curling out of the top edge of the book, even the slashes of texture across the paper – all are subtle reminders of the embers of fury that can threaten to break through the reality of our daily lives. This fear is inceptive, just at its beginning, but growing. The quickly scrawled phrase, fitted uncomfortably within its quote marks, edges the text, with a looming shadow behind it, and a sharp cliff of words dropping off in front. “Smitten” is a word of radical contrasts – suggesting a powerful physical blow, or being overwhelmed by love. “Fear” can feel physical, can hit us with a corporeal strength – or we can be entranced with it, at the same time as it pains us. Altered colors infuse these contrasts into the image – the warm, nearly painful reds and oranges, the cool but discomforting blues that edge the page and the letters. 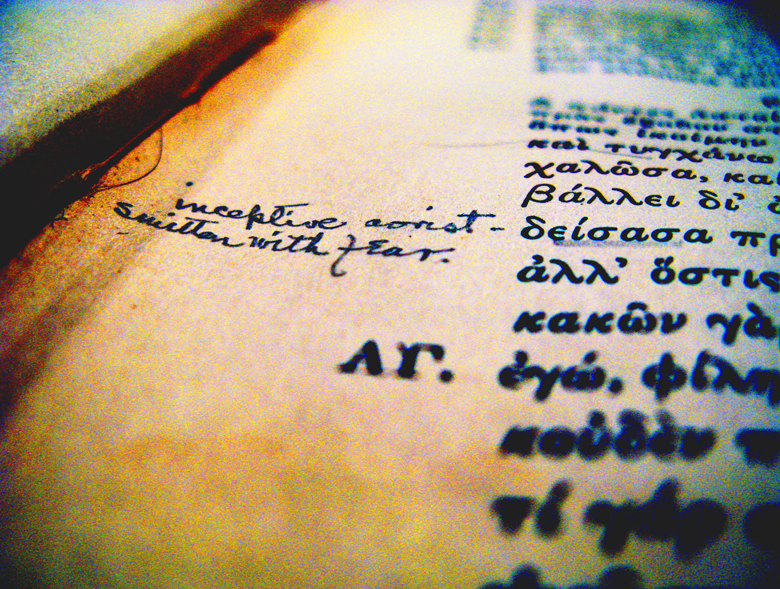 The book angles away from the viewer. Perhaps it was put down, as the emotion became too tangible, too intimate. 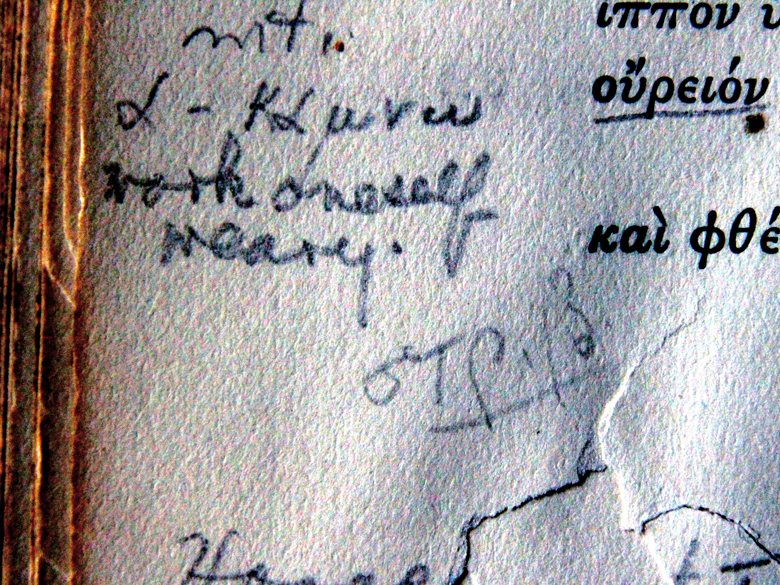 “Work oneself weary” – a demand and a dilemma that is thousands of years old, as Sophocles expressed it in Antigone. It is over 100 years old, when Meta Glass worked her way painstakingly through translating the same text. And today, we live in an era in which constant work seems required. 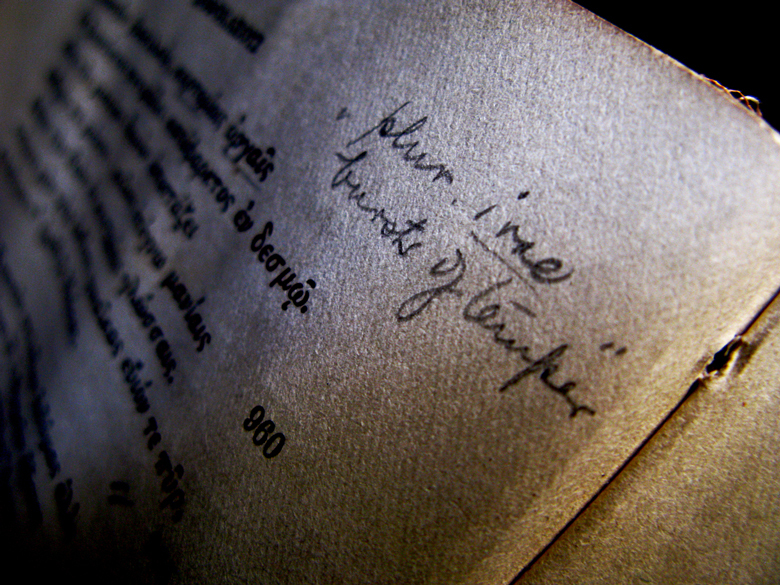 The words, written in tight script, sit up against the very edge of the page, near the golden glow of the pages already read, while the book itself shows the strain of years of “being worked” in its ripped, bent, and warped state. An accidental stain hovers menacingly over “with my consent.” The irony of its location has been intensified, with its color pushed to suggest dried blood. Perhaps, in its bluntest form, this consent was more coerced than willing? Or, in a more nuanced reading, the consent was given at a cost, perhaps one more emotional than physical. And yet – it may be just its coincidental placement on the page that suggests we read any negative implications at all. 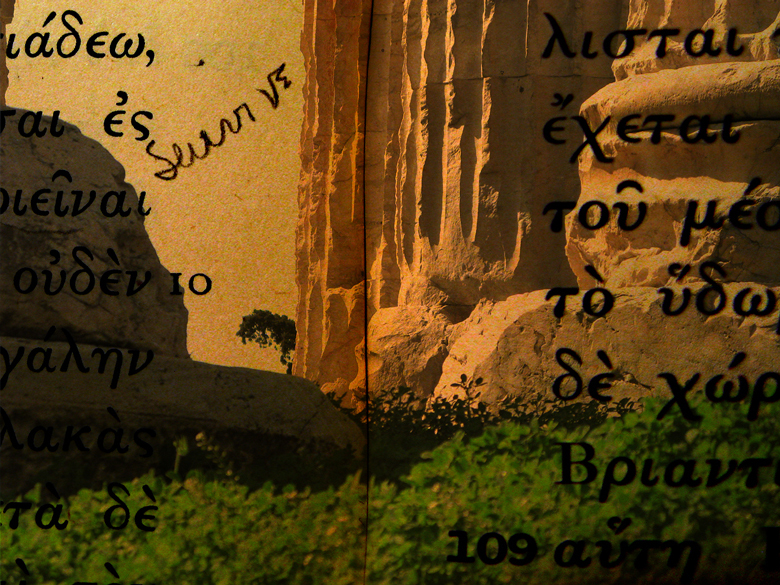 The Inquiries series follows Meta Glass’s marginalia throughout Books VII and VIII of Herodotus’s Histories. The images, with their unnatural, eerie colors, offer a visual commentary on the words, suggesting that all is not necessarily as it seems. The strength of the standing columns, peered at from behind a fringe of foliage, is undermined by their ruined state, as well as by the red water stain on the page, that hangs ominously between them. The replica caryatids, barely visible behind massive stone blocks, are strong women gracefully holding up a roof’s strict horizontality, while it simultaneously presses down on them. 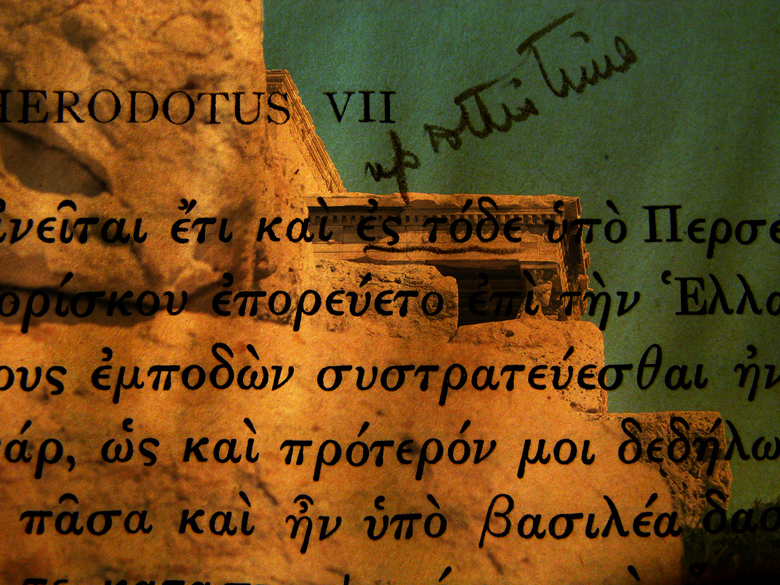 Superimposed over the image are the orderly, organized lines that Herodotus made of the mess of history, and the scrawled handwritten words suggesting a melding of past and present. 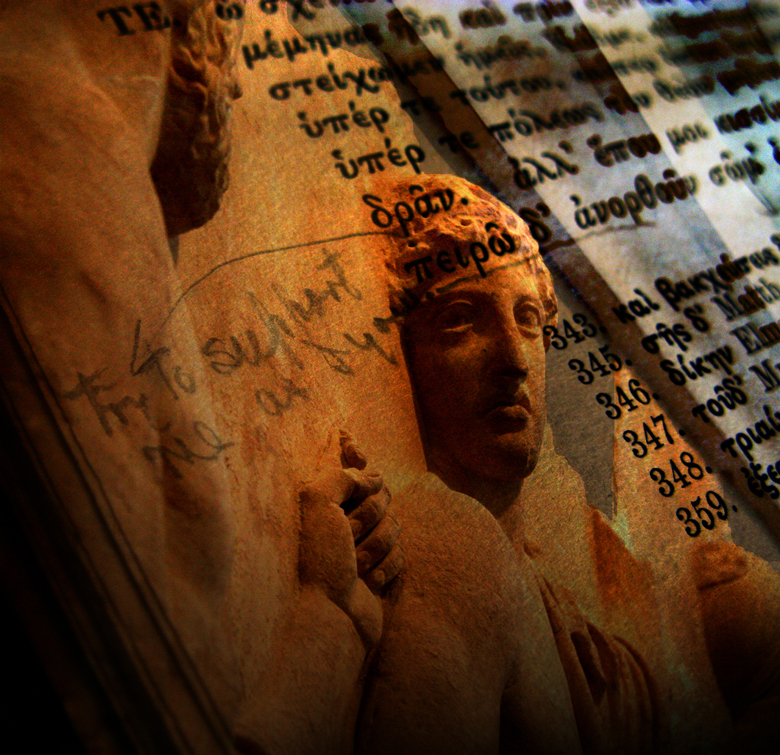 All are markers of the world in which they were created, of the people of Herodotus’ time, of those well before his time, as well as those living now – up to this time. Tall, serene columns are a muted presence within an encircling frame of evergreens that also encompasses the handwritten “family,” its importance emphatically underlined. Family is strong over years, warmly embracing, written into the book whose stacked pages echo the assertive, solid verticality of the columns. But as happens with many families, perhaps there is also an edge. The density of the trees, the green tinge inserting itself over columns and rocks, that implication that a perfect, sunny day might inexplicably be altered. 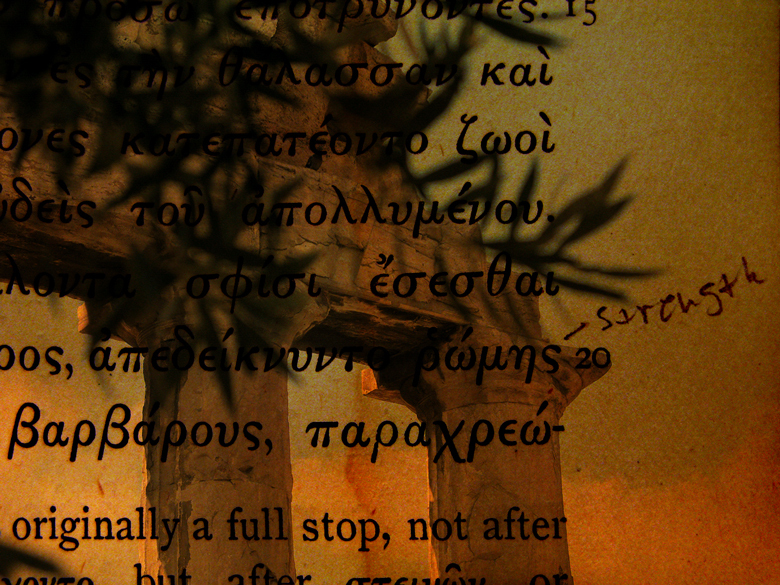 So much survival – the columns, powerful in their aged state; the green ground cover and scraggly tree, breaking through seemingly infertile ground; all shimmering in the same sun that illuminated ancient Greece, and now shines over modern Athens, its people surviving, still there, still making history.